Just in time for Christmas or perhaps just in time to ruin Christmas for some, Paramount have released a great collection of South Park episodes that revolve around this joyful and merry time of the year. 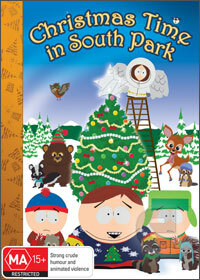 Featuring 7 Christmas episodes from Season 1 to Season 8 which features greats such as Mr. Hanky or the dangerously and politically incorrect Woodland Critter Christmas, this collection definitely had me in stitches and as the series progressed, it was great to see how creators Trey Parker and Matt Stone continued to push the boundaries. The video quality is nothing special but the images are sharp and colour palette is impressive. Add in strong black levels and as the series progresses, so does the video quality. The sound is quite acceptable but don't expect those Hollywood blockbuster movies. Unfortunately there are no special features in this collection which is a shame. With 7 diverse and hilariously entertaining episodes, it's easy to see how South Park is so popular and best of all, it continued to make waves with what those politically incorrect naysayers believe should never be included in a comedy series or more specifically a cartoon series. Featuring escaped convicts, Santa, Jesus, Mr. Hanky the Christmas poo who leaves skid marks when he travels or those strange looking Canadians, it's great to sit down, especially in this crazy season called Christmas and relax, enjoy and laugh out loud with friends and families.